If a test fails in the woods and no one is there to see it turn red, did it really fail? Whilst your jobs can automatically trigger without a human, it isn't often helpful for them to fail without a human being notified. If you use Slack, or a different chat room where your team hangs out, then I suggest having your pipeline inform you of failures or successes. Consider a job that quietly fails 50% of the time but doesn't notify anyone. Create this pipeline and run the test job a few times. Sometimes it will succeed and other times it will fail. Specifically for Slack there is a custom Resource Type cfcommunity/slack-notification-resource (see source on Github). We can add any custom Resource Types to our pipeline.yml with the top-level resource_types. You want to send slack notifications. First you'll need to create an organization or be invited. In the examples below I will use the defunct https://concourseci.slack.com organization. Update concourseci to your organization. Choose a public or private channel into which your notifications will be delivered. For this tutorial, choose your own personal channel "Privately to you". Click "Add Incoming WebHooks integration" button. On the next page, you will be given a unique secret URL. Triple click to select, then copy it to your clipboard. If you haven't already, add to your pipeline.yml the resource_types section and additional resources section introduced in Custom Resource Types above. Next, we need to introduce the on_failure section of all build plan steps. We use the on_failure to invoke the slack-notification resource named notify which will send a message to our ((slack-webhook)) web hook. In the preceding section the notification text was hardcoded within the pipeline-slack-failures.yml file. It is possible to generate dynamic messages for your notifications. It is also possible to emit success notifications. text: Static text of the message to send. text_file: File that contains the message to send. This allows the message to be generated by a previous task step in the Concourse job. We will switch from text to text_file. 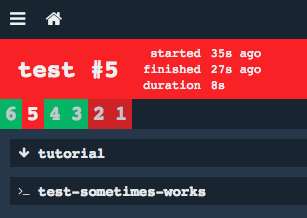 We will also add an on_success step hook to explicitly catch both success and failure outcomes of the task: test-sometimes-works step and display a message. Above, the notify-message folder is created by the task: test-sometimes-works step as an output, and consumed by put: notify resource. See the Basics section on Passing task outputs to another task to revise this topic. The task: test-sometimes-works step runs the test-sometimes-works-notify-message.sh script, which is the same as test-sometimes-works.sh but also creates a file notify_message/message. Unfortunately the \`test\` job failed. The random value $value needed to be less than 16384 to succeed. Hurray! The \`test\` job succeeded. The random value $value needed to be less than 16384 to succeed. On failure, the message will start with "Unfortunately...". On success, the message will start with "Harray!". Visit https://api.slack.com/incoming-webhooks to learn more about contents of Slack messages.